Christians and Muslims both have an abundance of names for God. The Bible provides Christians with a rich array of names for God, and the ninety-nine Names that Islam gives traditionally to God are drawn from the Qur'an. Praise the Name of the Lord is an offering of texts, from the Qur'an and the Bible, meant to lead to meditation and prayer. To pray starting from the texts of another religion can help us to acquire a better appreciation of that religion. It is possible that we will find different echoes that can capture our attention and may nourish our prayer, encouraging dialogue with the persons among whom we are living. Archbishop Michael Louis Fitzgerald, MAfr, was ordained priest as a member of the Society of Missionaries of Africa (White Fathers) in 1961, and he obtained his doctorate in theology from the Pontifical Gregorian University (1965) and a BAhons in Arabic from the School of Oriental and African Studies, London University (1968). He served on the General Council of the Missionaries of Africa (1980-1986) and the Pontifical Council for Interreligious Dialogue. He was ordained bishop in 1992 and was raised to the rank of archbishop in 2002. From 2006 to 2012, he was apostolic nuncio in Egypt and delegate to the League of Arab States. He is author (with R. Caspar) of Signs of Dialogue (1992); Dieu rêve d'unité (2005); (with John Borelli) of Interfaith Dialogue (2006), and of numerous articles. "A teacher is the person who can share the richness of their own experience while all the while keeping the material fresh and inviting. I found that the author succeeded in inviting me into a deepening appreciation for the names of God that are essential to two vibrant religious traditions. He did so with both the validity of experience and the respect of a person who walks the path of the sacred." "Archbishop Michael Fitzgerald provides a wealth of insightful yet prayerful reflections on the abundant Names of God bestowed through Qur'anic verses and followed by musings on biblical passages brought to mind as the mediation unfolds. His masterful arrangement generates a rich interplay between living sacred texts through eight developing themes. Throughout, he draws adeptly from decades of experience in Christian-Muslim studies and dialogue. 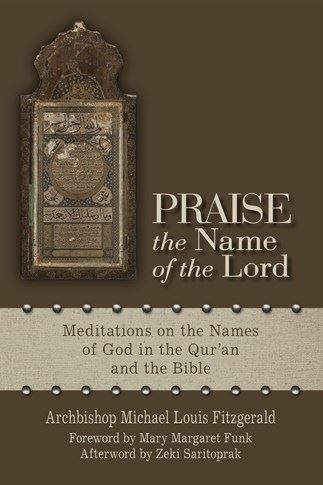 Praise the Name of the Lord is a study guide for Christian-Muslim spiritual encounter, a scholarly contribution on two faiths in dialogue, and a prayerbook for remembering God." "Both Christians and Muslims recognize a God who creates, who draws near, who judges, and who guides. Both Muslims and Christians have also found many ways to name the aspects and attributes of the divine being. In this innovative book Archbishop Fitzgerald offers an insightful exploration of divine names drawn from both the Bible and the Qur'an, producing a volume that combines a fascinating excursus in comparative theology with a compendium of passages that can serve as material for a group retreat or for personal reflection." "This book offers the reader a way to pray together with others without an agenda that the `other' person see and do it `our' way. Anyone reading this book and using it in a meditative way is challenged to see `the other' from the inside which hopefully promotes understanding and a deeper appreciation of the other." "In this little volume, Archbishop Fitzgerald's meditations bear the mark of one who has studied deeply and with great integrity over a lifetime the sacred texts and languages of the Abrahamic faiths. Without compromising in the least his faithfulness to the Christian tradition, he deftly manages to present Muslim and Jewish renderings of the Names of God with the respect and objectivity reflective of his long years spent in dialogue with these communities. Importantly, while learned readers will surely benefit from his erudition, those currently laboring away at interreligious dialogue will also find themselves to be fortunate recipients of a wonderful model for doing intertextual studies of sacred texts." "Fitzgerald's book is perfect for Christians who wish to better understand one entry-point into Islamic spirituality by relating it to their own tradition." "Fitzgerald hopes that this volume will encourage dialogue between Christians and Muslims; readers interested in this important endeavor will find it a helpful resource." "Archbishop Michael Fitzgerald has devoted his life to the study of Islam and dialogue with Muslims. In Praise the Name of the Lord he skillfully combines scholarship and spiritual insight to show how the Islamic tradition of constant remembrance (dhikr) of the Beautiful Names of God can be a source of inspiration for Christians. As is the case for both Muslims and Christians, remembrance—anamnesis is the term in the Christian Scriptures—is meant to lead to praise of God and imitation of the divine qualities. Drawing on passages of the Holy Bible that resonate with various Names of God in the Nobel Qur'an, Archbishop Fitzgerald encourages readers, be they Christian or Muslim, to appreciate the spiritual riches of another religious tradition and to come to a deeper understanding and appreciation of their own." "This beautiful reflection is valuable for anyone who wants to understand the Muslim tradition of meditation on God's Ninety-Nine Names more deeply. Archbishop Fitzgerald draws biblical and qur'anic passages into conversation with each other in a way that is accessible to everyone. An inspiring example of true dialogue of religious experience."